Sonically, the HeadRush is a quality performer. Massive power, headroom and clarity at a very affordable price point. The cabinet isn’t so portable because of its shape, but there’s not much else to fault at the price. During the last decade or so, digital amplification and effects modelling has properly come of age, with software and hardware capable of producing convincing amp-like sounds that are hard to separate from the real thing. There’s also been a significant advance at the guitar end of the signal chain, with products such as Line 6’s Variax capable of sounding like a multitude of instruments in any tuning you like, all at the touch of a button. At the other end of the chain, we’ve seen the development of IR (impulse response) technology, to mimic the dynamics of different speaker cabinets and microphone arrangements. While many companies package their digital products in conventional-looking plywood boxes with speakers, the professional end of the market is tending towards all-in-one rack or floorboard controllers, such as the HeadRush Pedalboard, which is portable and output directly to a PA without the need for microphones. This is an ideal setup for the modern ‘quiet stage’ approach, where performers use in-ear monitoring, but for more conventional live use some kind of local monitoring is needed, ideally something that won’t colour your carefully constructed amp sounds. One abbreviation doing the rounds at the moment is ‘FRFR’, which stands for ‘Full Range, Flat Response’. In simpler terms, this means a powered PA-style monitor, so you can plug your amp modeller into a PA but still have a volume knob you can turn up when you need to - after all, we are guitarists! HeadRush’s FRFR looks like a conventional modern PA speaker, with separate 12-inch and horn-loaded compression drivers in a practically indestructible polypropylene wedge casing that can sit on the floor or be pole-mounted. On the rear panel there’s a pair of inputs on combi XLR/jack sockets with separate volume controls, and a single XLR output for connection to a PA or another FRFR, with ground lift and EQ contour switches. Basic fare maybe, but everything you need to amplify your cabinet and speaker models is here. Most importantly, inside the enclosure there’s a chunky power amp capable of producing a whopping 2,000 watts at peak or around 1,000 watts continuous. Whichever rating you choose, that’s ample power for any venue, with headroom to carry over every nuance of your sound. The monitor powers up cleanly and smoothly; we tried it out with an entry-level amp modelling pedal and a higher-grade rack unit. Sonically, the HeadRush is a quality performer, with the massive headroom of the HeadRush FRFR making itself felt as well as heard. While the 2,000-watt figure is qualified as a peak measurement, this still works out at around 1,000 watts continuous, which is respectably loud by any standard, with no less than 128 dB SPL. With immense power comes great clarity and the HeadRush is perfect for music that demands precise definition, like metal, or anything that uses detuned instruments. The only downside to this level of power is that any mistake you make is reproduced with the same stunning clarity. 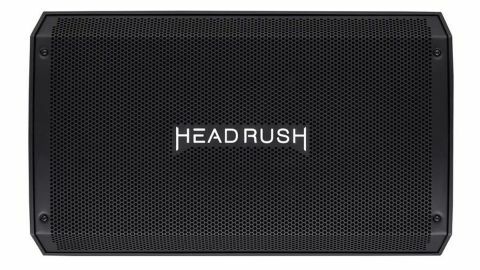 So if you’re prone to sloppiness, then be prepared to polish your chops if you want to get the most from the HeadRush’s huge headroom. The HeadRush is a great choice for bigger stages and all kinds of modellers, including HeadRush’s own. It’s particularly good for metal, thrash and modern rock and also relatively inexpensive, so you get a lot for your cash. No speaker simulation means you’re relying on the built-in cab and mic sims of your modeller, but that’s what most of us do anyway.